I've been having a bit of a snaffu trying to create a /JFD format image of my original Crystal Maze floppy discs. I'm using !ADFFS v2.64 on my StrongARM RISC PC running RISC OS 4.39 in ROM with 50MB of RAM. The discs are in excellent condition and all three verify perfectly. Regardless of whether I go into the list of pre-programmed disc images and use the template and recording file or just do it manually without referencing the recording file, database etc I get the error "Compression error (-2)". If I use !ADFFS to create an /ADF image of the discs that works perfectly. 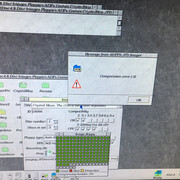 I'm using ADFFS v2.64 on RISC OS 4.39 on a StrongARM RISC PC with 50MB of RAM and I've tried saving the image to CF/SD hard drive, physical spinning HDD and to RAM disc. No joy.